Beautiful Antique Chinese Quality 20ct Gold Cufflinks, WC, Orig Box. 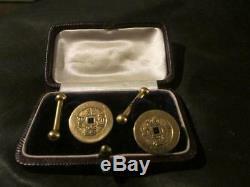 Here is the most beautiful pair of mens antique quality chinese 20ct gold cufflinks. The cufflinks measure threequarter inches in diameter & are all made of 20ct rose gold with a lovely rich patina to the gold. These cufflinks are such beautiful quality with a circular shape & then the centre has chinese writing around a square pierced centre. There is a gold linking chain to the retainer which is dumb bell shaped. On the back both links are clearly marked for the early 20ct gold mark & makers mark WC, with other chinese marks & they are chinese in origin & are all origional & antique & a good weigh of 6.9g & nicely they come in their origional antique velvet & silk lined box. These really are a lovely pair of antique chinese 20ct gold cufflinks in very good origional complete condition that are such lovely quality & look very distinguished worn & would make a really lovely gift. I love antique jewellery, so hope that you to can appreciate my items, that have been pre loved with history. But remember all my items are antique, vintage and pre owned, which is totally different to new. Please look at photos, pics carefully, sizes, and read the whole listing. Remember this is all my opinion, which may be different to your own. Get images that make Supersized seem small. Tailor your auctions with Auctiva's. The item "Beautiful Antique Chinese Quality 20ct Gold Cufflinks, WC, Orig Box" is in sale since Sunday, November 18, 2018. This item is in the category "Jewellery & Watches\Vintage & Antique Jewellery\Vintage Fine Jewellery\Art Deco (1915-1935)". The seller is "dragonheartantiquejewellery" and is located in South West.